Everyone that knows me knows that I love Christmastime…its truly my favorite time of the year and all my life I have wanted to have the Christmas experience in New York City….to feel the city, experience the flavor of it and see it dressed out in all its holiday finery has always been something I wanted to be a part of. There is no other place quite like New York, a city that is truly the Great American Melting Pot, comprised of people of all cultures, races, religions and beliefs, a city that has experienced the worst of terrorism but with an indomitable spirit like no other, has survived it, reinvented itself and moves forward, always in motion, never stopping for more than a moment to reassess itself and chart it course. Add to that the joy of the holiday season, captured in spirit through classic films such as “Miracle on 34th Street” and “The Bishop’s Wife” and there just seems no better place to go and experience Christmas than the Big Apple. Experiencing it, not only through my eyes but through those of my son, I have come away not at all disappointed in the experience. In my previous posts, I covered arriving in the city, visiting the Statute of Liberty (from a boat but still close enough to see it well), a harrowing cab ride and one in a Smart car, Times Square and the Guggenheim. I also wrote, as best I could, of experiencing a visit to Santa Claus at the classic New York City Macy’s, where millions of children from all over the city and the world have travelled to visit the jolly old elf and whisper their dreams of Christmas plunder in his ear. Such a visit is always good for a sage word or two about not just being good but having the spirit of Christmas in your heart, which is being good in itself. It was an experience I will treasure from now on. 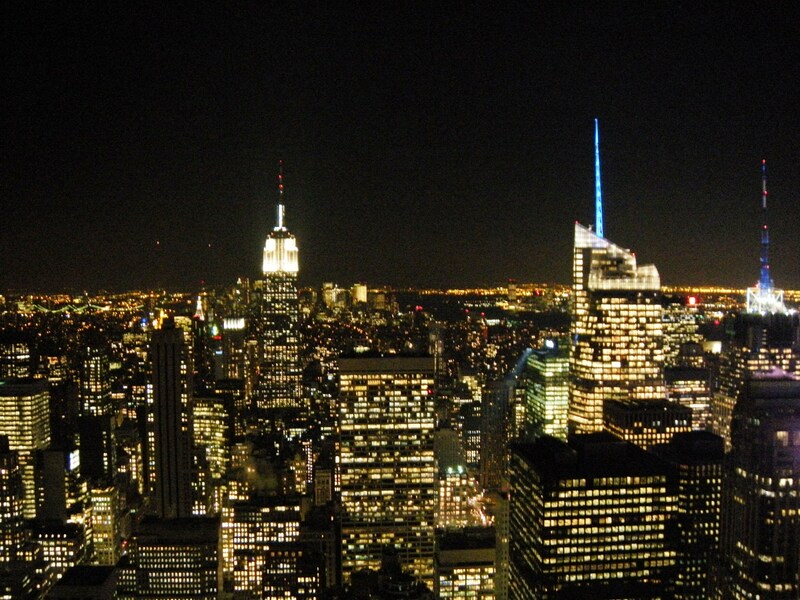 The last few days in New York were also treasures in time whose memories I will always keep. 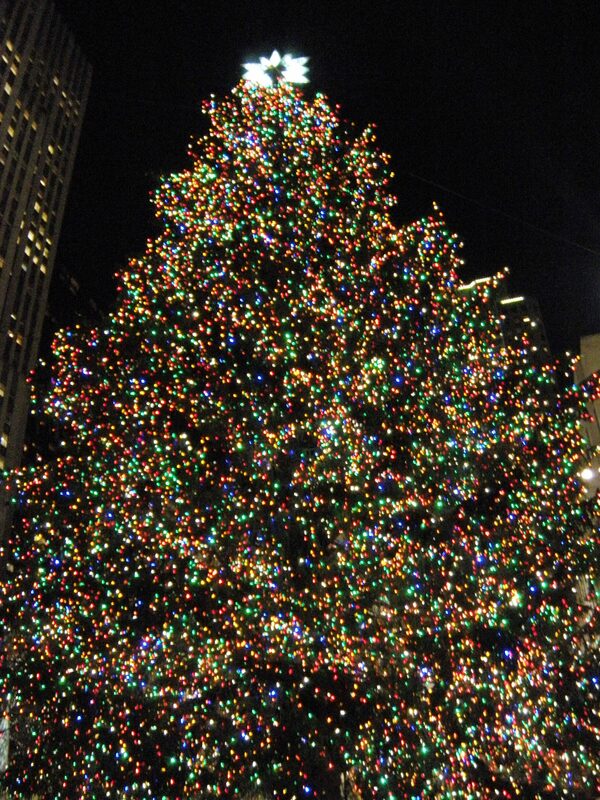 New York City is a city of lights and sounds and Christmas is no exception to that. On Monday evening of this week, the family and I found ourselves out on the town and we made our way by Radio City Music Hall and the Rockefeller Center skyscraper, home of NBC studios and many other interesting things. First timers to New York should certainly try out the Empire State Building observation platform if you are willing to brave the long lines and the cramped elevator ride to get a breathtaking view of the city but for the more seasoned traveller, a trip to the top of the Rockefeller Center building, or the “Top of the Rock” as they call it there is a much better experience with an equally impressive view and a lot less hassle, even at Christmas. We purchased tickets and went through an interactive display that included a short movie and then took the elevator to the top. When we arrived, we found a nice indoor room with floor to ceiling windows and a panorama of the entire city around us. Step out through the doors and you are outside on a large patio complete with binoculars and large glass window barriers that keep the New York wind down while allowing unimpeded views of the city around you-and a spectacular view of the Empire State Building itself which you would not get to see any other way. Looking down, you see millions of lights as the city glows like a glittering diamond and the sounds of traffic, sirens and other city sounds are much less pronounced at this height. We stayed for at least twenty minutes, capturing on film the beautiful spectacle that lay at our feet, then made our way down to the gift store for a few touristy souvenirs. Once outside, you come into the plaza itself and the symbol of Christmas for all New Yorker’s, the Rockefeller Center Christmas Tree that presides over the ice rink and plaza grounds. The centerpiece of Christmas in New York, the tree is probably the largest Christmas tree in the city, usually around 100 feet tall and holding thousands of lights. For 2010, the tree featured lights of all different colors and is the focal point of the plaza, surrounded by flags of many nations and angels with trumpets held aloft as if to herald the coming of Christmas to the city. No trip to New York at Christmas would be complete without seeing this beautiful sight and observing how it delights both young and old, local and tourist, and even those who don’t celebrate the holiday, all of whom come just to see it in all of its spectacular glory. 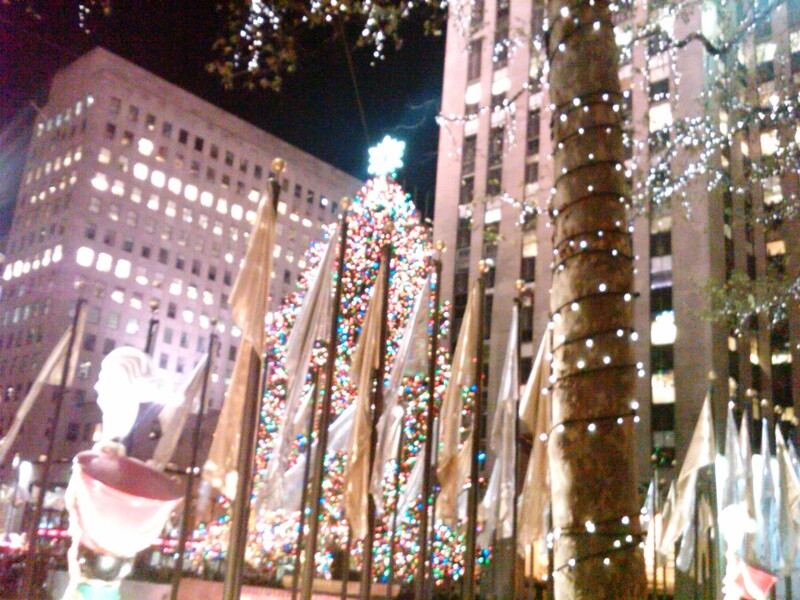 In a city of fascinating sights to see and beautiful things to draw the attention, the Christmas Tree at Rockerfeller Center stands alone and without peer as a symbol of the Christmas Spririt and the Holiday Season. 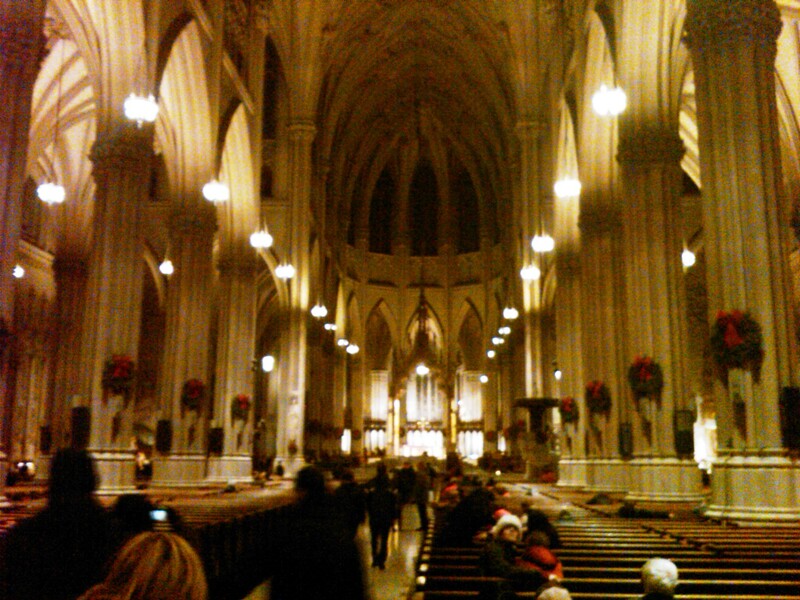 Walking back towards our hotel, we stopped off at St. Patrick’s Cathedral, the seat of the Catholic Archdiocese of New York and one of the true architectural masterpieces of the city. Constructed in the Neo-Gothic style, the Cathedral rises over 300 feet high at its twin spires, though not a great height by the standards of its neighbors-still, it is unique and occupies a proud place in the heart of midtown Manhattan. Seeing the large cathedral nave decorated for Christmas visually reinforced the real reason we celebrate Christmas and if that wasn’t enough, while we were inside the nave, the powerful cathedral pipe organ began to play, its clear, sonorous notes resonating both deeply and clearly throughout the interior of the sacred structure. We paused to sit and listen to its song and take note of the surroundings, decorated in Advent purple, wreaths of holly green and scarlet trim hanging from each massive pillar. In this place, you could feel a true spirit of Christmas pervading every nook, and believe me, there are a lot of nooks in the Cathedral. New York is a place of great culinary delights, from small diners that line the streets to better restaurants scattered throughout the city and we decided to try one that was not only across the street from our hotel but had been recommended by our friends who lived in Manhattan. Smith & Wollensky, “the steakhouse to end all arguments” proved to be as good as we had heard. Cozy and intimate, yet lively and festive for the holidays, S & W proved to be one of the best steak houses I have dined in and believe me, I know (and love) a good steak when I see (taste) one. Even though the restaurant was busy, they seated us without a reservation (thanks again, no doubt, to the cute kid we always had with us in tow) and the generous portions were both savory and filling. While pricey, if you love a good steak served in a warm social environment, you can’t go wrong with Smith & Wollensky when in New York. Tuesday marked our last full day in the city and this was the day to do anything we had not done already so we made another trip down to Fifth Avenue, hitting F.A.O. Schwarz once again, plus a side trip to the Apple Store and Bergdorf Goodman Men’s Store. 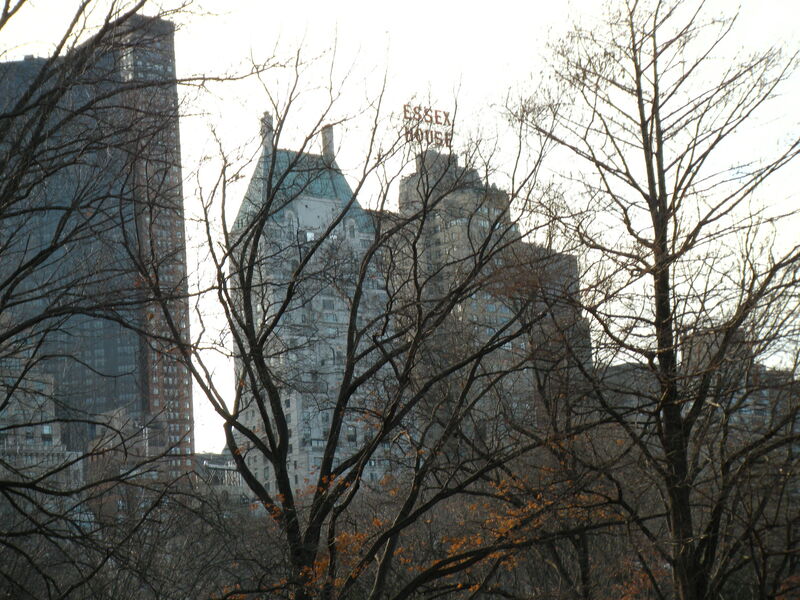 I had promised my wife a ride in Central Park, another favorite place in the city and so we walked around the Plaza Hotel to the horse-drawn carriage lineup and climbed aboard for a short ride through the park. Though bare of almost all vegetation during this time of the year, Central Park is still a beautiful place of old trees, rises in the land, natural rock formations, ponds, pools and creeks, all connected by roads, ornamental bridges and walking paths. From our perch, we could see skaters out enjoying the ice rink and others walked through the park, dressed warmly for the cold, windy weather. I only wish we could have stood the cold to take a ride through the park at night and see it decorated for the season-it certainly would have been worth seeing. After Central Park, it was time to get ready for the pinnacle of our Christmas experience in the Big Apple: the Radio City Rockette’s Christmas Spectacular at Radio City Music Hall. I had never seen the Rockettes perform before so I was not exactly sure what to expect but after another cold walk, we arrived at the theater and found our way into the very Art Deco-styled entry hall and to our seats in the second mezzanine. We had a very good view of the stage and I was amazed at how much larger this theater was than the beautiful Fox Theater I have been going to in Atlanta all my life. The enormous domed roof soared high above us and the acoustics were very good, as demonstrated by a performance of the theater organ, played by two organists on separate keyboard consoles. This little concert just before the start of the show really set the stage for the spectacular production that would follow. The Rockettes danced to many popular Christmas songs and did several numbers from the Nutcracker Suite, all in a show hosted by none other than Kris Kringle himself, who took his audience on a magic sleigh ride from the North Pole to New York City via a 3D projection on a large screen. The finale was a telling of the Christmas story, from the shepherds to the wise men, all converging on Bethlehem to proclaim the birth of Christ. The nativity scene was inspirational, set to the music of “Hark the Herald Angels Sing” performed by the organ, supporting choir and the Rockettes themselves. I left the theater energized with the Christmas spirit and entered the streets of New York feeling at one with the season. As we walked once more by the Great Tree at Rockefeller Center, I seemed to be surrounded by Christmas in every direction and the world seemed a much brighter place than before. It was a George Bailey moment for sure. One doesn’t have to travel to New York City to find Christmas for if you keep Chrsitmas with you, if it is inside of you, it will always be there and sometimes you just need to be reminded that it is there and to let it out. Christmas has to be shared and though I would have enjoyed it had I just been by myself, the experience would have been a flat one and not at all the same if my wife and son had not been there to share in it with me because family is an important part of Christmas and we will all have memories we can share and treasure with each other. I wouldn’t trade the experience of Christmas in New York for anything and despite the inconveniences of travel, it was well worth it, for long after the touristy souvenirs are gone, the memories will endure and hopefully, for my son, they will form the basis of some of his own Christmas memories to enjoy over the years ahead. Maybe someday, when he is grown, he will take his own children to New York and let them experience for themselves a Christmas that is unlike any other and will recall that when he was a small boy, he got to travel to a great city, full of sights and sounds to both delight the senses and intrigue the imagination, that he met Santa Claus on a magical journey to the North Pole and that he got to see the biggest Christmas tree he had ever seen. He is at that age right now where the Christmas presents are a big deal and he anticipates the gifts which he might receive but I know without a doubt that as he gets older and has the perspective of a life to look back on, that he will come to the realization that Christmas, aside from all its religious implications and reasons for being, is not about the new gifts that we receive but about the old traditions that we love and that we celebrate each year….traditions in song, lights, family gatherings, memories reawakened and shared, of good food cooking and of those quirky things that each family does every year as a part of celebrating Christmas. These all become a part of the fabric of our lives, a part of nostalgia, where we long to go back to a time that we desperately want to be a part of again and to find, for a brief time of the year, the peace, the joy and the contentment that Christmas brings with it each year. It is my hope that all of us enjoy the Christmas spirit this year, in whatever way it is given to us and in whatever way we can find it.